April 30 - Flypast Children With Diabetes Camp, Cotswolds. 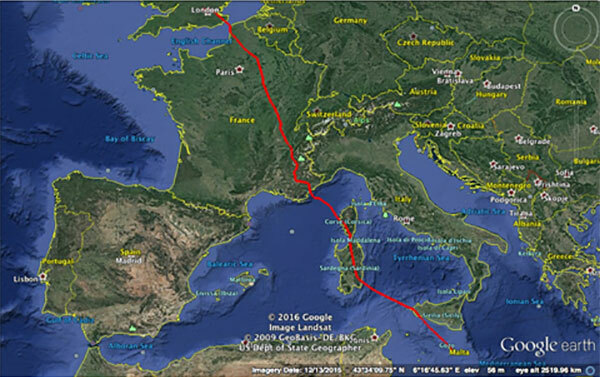 July 15th - Speed Record from London to Malta. July 21, 22, 24 - Diabetes Formation Flight USA training, Council Bluffs, IA. July 23 - Flying With Diabetes Day/Pilots With Diabetes Fly-In, Council Bluffs, Iowa. September 16, 17 & 18 September - Diabetes Formation Flight Tour USA; California. 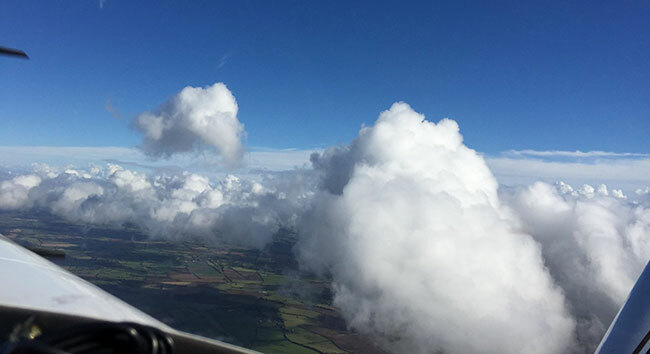 October 15 - Flying With Diabetes Day 2016; Duxford Imperial War Museum. We had a great Flying With Diabetes Day on the 15th October at Duxford Imperial War Museum AirSpace Conference Centre with over 100 attendees - a huge thank you to everyone for coming, to all our speakers; Malcolm Knowles, Mike Cross, Gavin Griffiths, Karl, Dr Frank Waldron-Lynch and Pete Davies, and to JDRF, in particualr Celia Joseph for helping advertise and register everyone and excellent help on the day! Also had an excellent short flight today in G-ZUMU out of Denham Aerodrome, chalking up the 150th logged hour for 2016, with a few loops and viewing some excellent cloud formations near Oxford. What a truly great day’s flying! 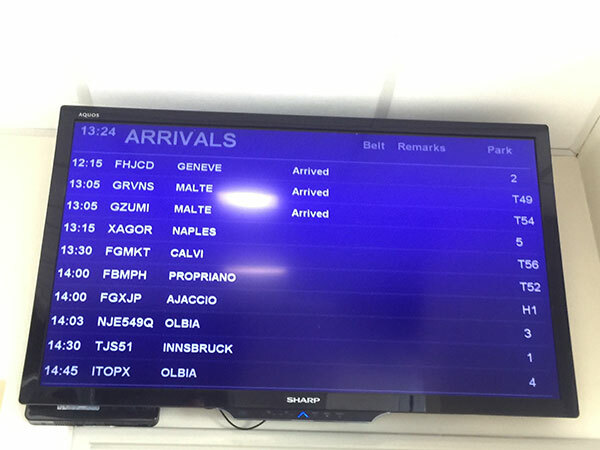 Subject to ratification, we have set a new world aviation speed record from London to Malta! 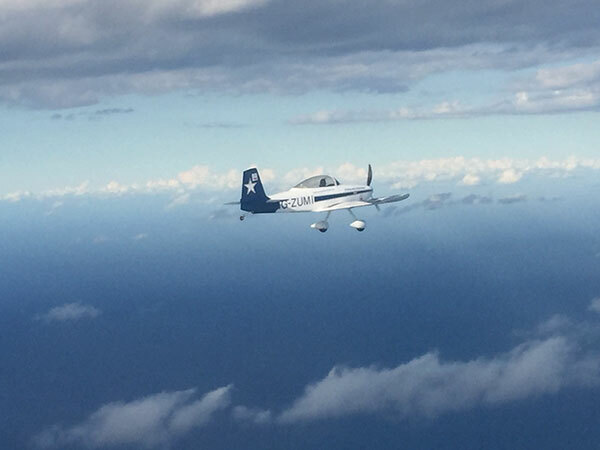 Karl and I set off from Denham, west of London at 6:10 a.m. in the Flying With Diabetes Vans RV8 and Vans RV4, and over 12 hours and 48 minutes, in clear, sunny weather we crossed the English Channel, France, Corsica, Sardinia and Sicily before reaching Malta just as the sun was setting. We had three refuelling stops - Le Touquet, Gap Tallard in the French Alps and Figari Sud on the southern tip of Corsica. Thankfully we built contingency time into the journey, as the refuelling staff at Gap Tallard had unexpectedly gone for lunch! 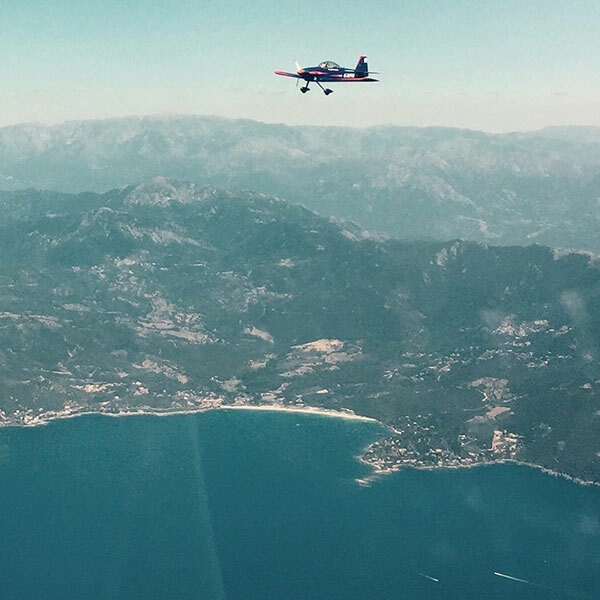 We were delayed by over 40 minutes and it was only after refuelling in Corsica that we knew we could make it to Malta before darkness fell – a requirement with the aircraft being equipped for daylight flying only. We were very lucky to have strong tailwinds between Corsica and Malta, pushing groundspeed up to 220 mph at times (bliss!). It was definitely a long day in relatively cramped cockpits, but extremely enjoyable, with stunning scenery over the French Alps, Corsica and Sardinia. Diabetes management went well throughout the day – we had to ensure sufficient diabetes supplies and carbohydrate were close to hand in the cockpits, as we used the UK’s system for regular blood sugar testing to ensure that blood sugars remain within a required range. 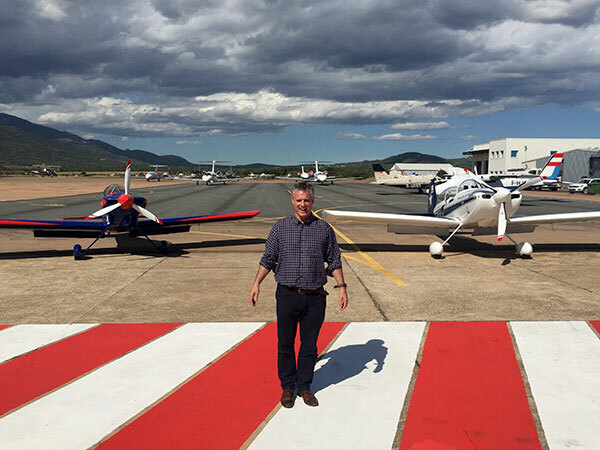 A massive thank you to Karl for carrying out the vast majority of the flight planning – there is an immense amount of planning required for such a flight, including permission in advance to land at airfields, filing flight plans and ensuring the route avoids restricted and prohibited airspace. 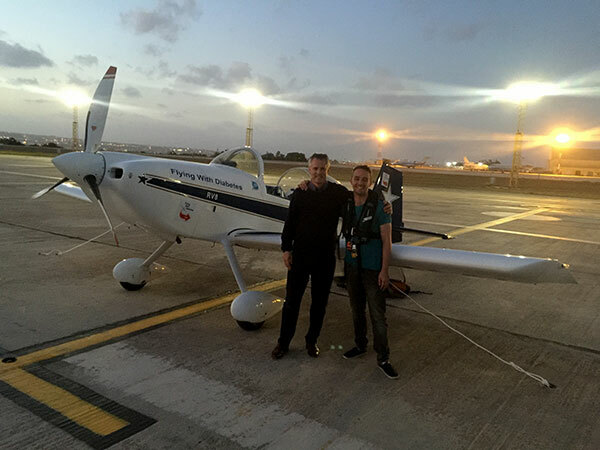 Also a huge thanks to Eva Ceh for officially observing the start at Denham so early in the morning, and Malta Air Traffic for observing the finish, and to Stanley and D.C. Aviation very much for sponsoring our landing and handling charges in Malta, and for very efficient handling at Malta Airport and excellent response times to communication – a huge thank you! We were also delighted that our flight coincided with the Maltese Diaebetes Association’s annual Dine 4 Diabetes fund-raising event and that Karl, Douglas and Douglas’s wife, Sophie could attend - thank you to Chris Delicata for accepting a late reservation; we really enjoyed the evening! Thank you very much to all for making donations so far – we very much hope to reach our target of £1000 via the link below! Thank you! The Diabetes Wellness Fair at Iowa Western Aviation Building at Council Bluffs in Iowa was held on 23 July. A huge thank you to John Allen, and Tara and Chriss at the Jennie Edmundson Foundation for organizing the event, and also to Scott Johnson, Happy Diabetes Chef Robert Lewis and Jason Harmon for speaking, and also to a number of local diabetes specialists for an excellent Expert Panel session! We had a great Flying With Diabetes Day on 7th November at Duxford Imperial War Museum – many thanks to everyone for coming and we hope that everyone enjoyed the day! A huge thanks to Pete Davies, Ian Cuddihy, Gavin Griffiths, Melissa Ford Holloway, Connor McKeever, Karl and Gary Mabbutt for great talks, and to Dexcom and Sanofi Diabetes for sponsoring the event. Also to Celia and JDRF for advertising the event and arranging registrations. We look forward to being in touch in April with details of Flying With Diabetes Day 2016. 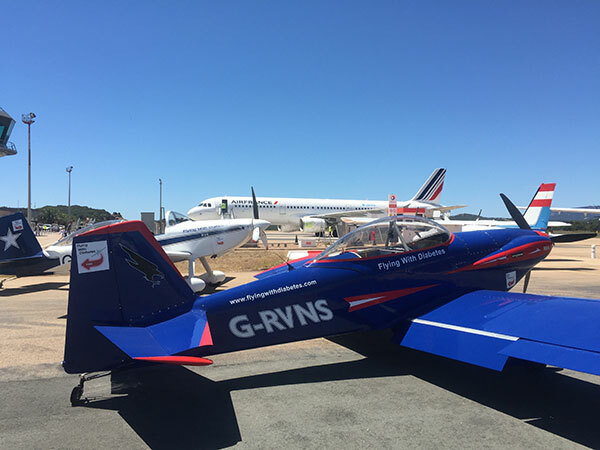 Meantime we are planning 2016 flying events which will include a formation speed record into continental Europe by Douglas and Karl in the Flying With Diabetes RV8 and RV4 aircraft, another " Diabetes Formation Flight USA" tour by up to seven aircraft in the USA in September, and a series of two-aircraft formation displays at JDRF and other outdoor events around the UK over summer - a list of events will be posted shortly in the new year.